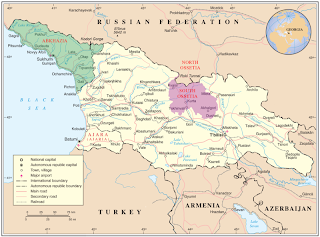 South Ossetia is a self-declared independent country located in what the United States and most of the international community regards as Georgian territory. It has functioned as an autonomous client state of Russia ever since the breakup of the Soviet Union in 1991. 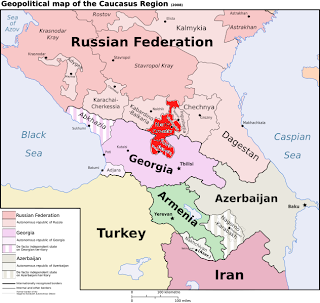 When Georgia made moves to reclaim South Ossetia in the summer of 2008, Russia invaded and defeated Georgia, and then officially recognized South Ossetia as an independent state. Russia’s diplomatic recognition of the breakaway region was in part done in protest against the recognition of the independence of Kosovo (formerly part of Serbia) by the United States and most European countries. Russia is now attempting to bolster its diplomatic position by encouraging other countries to recognize South Ossetia. Nicaragua was the first to sign on, followed by Venezuela. In mid-December, 2009, South Ossetia gained another political partner: the tiny Pacific country of Nauru. Informed sources claim that Russia essentially purchased such recognition with a $50 million economic aid package. Nauru, once one of the world’s richest counties on a per capita basis, certainly needs the money, as it has exhausted the phosphate deposits that once gave it wealth, generating an environmental disaster in the process. Such diplomatic maneuverings are not unique to South Ossetia and Kosovo. Taiwan and the People’s Republic of China, for example, have long dangled out aid packages in exchange for recognition, a game that Beijing is slowly winning. Thus far, Russia has fared poorly in its quest for international support for its client state. While only four internationally legitimate countries recognize South Ossetia, sixty-four currently recognize Kosovo. (South Ossetia is, however, recognized by several other generally unrecognized countries, such as Abkhazia). How many countries are there in the world today? As the South Ossetia example shows, no precise answer can be given, as it all depends on what one counts as a country. South Ossetia is plenty interesting in its own right, regardless of such diplomatic games. The Ossetians are the descendents of the ancient Alans, who were themselves an offshoot of the ancient Scythians. According to C. Scott Littleton and Linda Malcor’s fascinating book From Scythia to Camelot: A Radical Reassessment of the Legends of King Arthur, the Knights of the Round Table, and the Holy Grail, most of the Arthurian legends stem directly from the folklore of the Alans, many of whom were among the invaders of the dying Western Roman Empire in the fifth century. For a film interpretation of the Littleton and Malcor thesis, see Antoine Fuqua’s 2004 King Arthur. Also to note is the fact that South Ossetia is a small part of the larger Ossetian “nation.” Only some 70,000 people reside in South Ossetia, while over 700,000 live in neighboring North Ossetia-Alania, which is an internal republic of the Russian Federation (it is part of Russia, in other words). Roughly two thirds of the people of both North and South Ossetia are ethnically Ossetian.